If there’s one thing that everyone can agree on about durian it’s the odor. Not only is the odor strong and distinct, it permeates through layers of packaging and lingers interminably. Airlines and public transport authorities in Asia ban durian in the aircrafts, subway trains and buses. Hotels in the region similarly prohibit it in their rooms. To foreigners not familiar with this fruit the odor is so foul that few would attempt to eat it. Durian is the only fruit that the host of Bizarre Foods on the Travel Channel, Andrew Zimmern, simply couldn’t swallow. But to many other people the aroma, which becomes more pronounced as the fruit ripens, is the allure of the fruit. Therein lies the conundrum of durian: the stronger the odor the more desirable the fruit. The large quantity of sulfur compounds in the rind and the pulp of the fruit contributes to the odor. 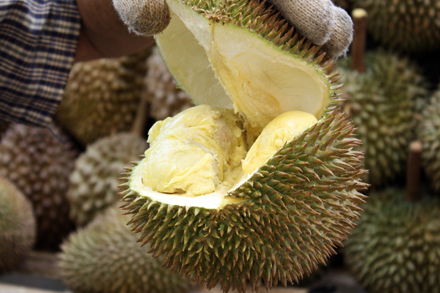 Harold McGee writes in On Food and Cooking that similar sulfur compounds “are found in onions, garlic, overripe cheese, skunk spray, and rotten eggs.” So it is no wonder that durian pulp has been compared to many of these items. But no one seems to be able to fully articulate the taste. 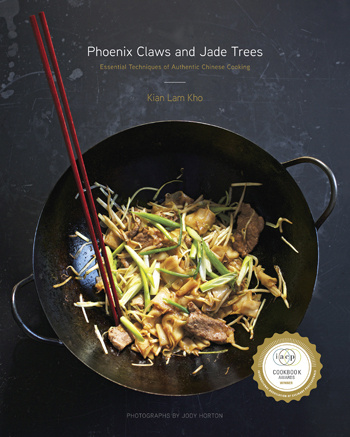 In The Long Day Wanes: A Malayan Trilogy, the British novelist Anthony Burgess describes the experience of eating durian “like eating sweet raspberry blancmange in the lavatory.” Andrew Zimmern told his audience it tastes like “completely rotten, mushy onions.” Perhaps similar to garlic the existence of sulfur compounds results in the extreme affection or revulsion of durian. It is, however, undeniable that the creamy custardy pulp is sweet and has a pleasant texture, qualities that are prized by many durian connoisseurs in Singapore and Malaysia. A variety known as D24, commonly available from Malaysia, is highly sought after for this very reason. The price of a four to five pounds D24 durian can reach as high as 20 U.S. dollars. Rather expensive considering that only around a quarter of the weight is the edible pulp. Durian lovers go all out to find vendors that sell fruits with the best texture and aroma. During our tour of Asia in August we visited the legendary durian stall at the foot of Dempsey Hill on Holland Road in Singapore. The stall keeper has been setting up a temporary shack in the parking lot there during durian seasons for more than thirty years. 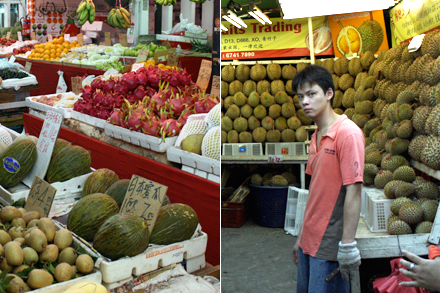 He professes to personally select the fruits from the best suppliers in Malaysia. The fruits he sells reliably offer the most aromatic, sweetest and creamiest pulp. His customers agree and the consistency of his durian selection brings them back every durian season. Twice a year, from June through August and November through January, durian lovers flock to this stall and either consume the fruits al fresco, or bring them home to share with their families. 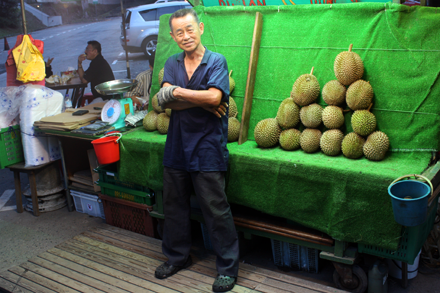 Unlike seasonal stalls the permanent fruit stores in the Geylang neighborhood of Singapore offer durian year round. 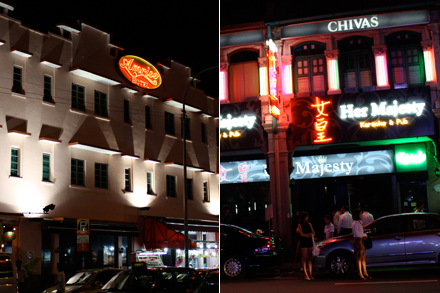 Geylang, well known as the red light district of Singapore, is an area full of restaurants and bustling nightlife. Short-term hotels and brothels line the side streets while the fruit stores, always brightly lit to showcase their durian, innocently coexist with the restaurants and nightclubs. For those who can’t wait for the durian season this is where they’d go to satisfy their craving. Slight differences in growing seasons all over Southeast Asia make it possible to ship durian to markets throughout the year. Discriminating durian lovers, however, still prefer to wait for the peak season of Malaysian durian when the fruit is at its best. In New York’s Chinatown one can buy durian from Thailand, which has become the largest exporter of this fruit. But the often-found Morn Thong variety from Thailand leaves much to be desired. Although the texture is creamy the aroma is very much lacking. I did however successfully make durian puffs with my purchase from Chinatown. You can follow my recipe below to make them yourself. 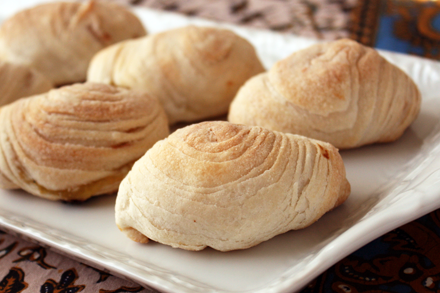 Durian puffs are a relatively new creation that has become very popular among the dimsum crowd throughout Asia. They are made with a puff pastry like dough and are often served warm, which enhances the aroma. If you’ve never tried durian before, then the less offensive odor of the Thai durian may be the way to start. Chinese layered pastry dough is very similar to the French puff pastry, which is made by folding and rolling a dough known as détrempe layered with butter. The Chinese version is made with a lard détrempe but layered with a lard and flour mixture like a beurre manié. Make the lard dough by first blend the flour, salt and sugar together then cut the lard into the flour mixture. You can either use a pastry cutter or regular knife to cut into the mixture until it forms a course grain texture. Add the water and knead the dough until smooth. Then make the lard cake by combining the flour and lard and mix well. Set them aside for about 20 minutes. Divide both the lard dough and lard cake into six equal portions and roll them into balls. Flatten the lard dough into a circle of about 6 inches in diameter and place a lard cake ball in the center. 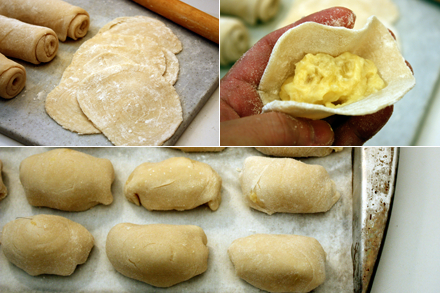 Fold up the lard dough to cover the lard cake completely and roll in to a ball. Repeat this for all the portions. With a rolling pin roll the combined pastry dough ball into a long strip of about five inches wide and a quarter inch thick. Then roll up the pastry dough strip lengthwise into a spiral. Using a rolling pin once again roll the dough lengthwise into another long strip of about five inches wide and quarter inch thick. Finally roll the strip lengthwise into another spiral cylindrical shape. Repeat this for all of the pastry dough portions. Be sure to wrap the pastry dough wrapper in plastic wrap if not used immediately. Mix the durian pulp with the sugar thoroughly and set aside until ready to wrap. 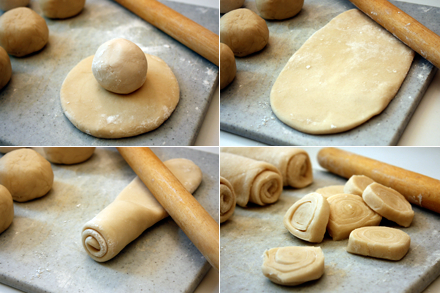 Cut each cylinder of the pastry dough into eight circular pieces. Put wach piece flat on the surface. Using a rolling pin roll the dough into a circle about four to five inches in diameter. Place about one tablespoonful of durian pulp in the center of the circle. 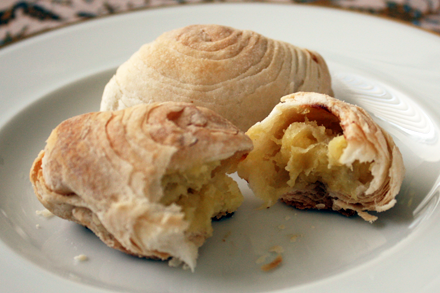 Wrap the dough around the filling forming an oblong shape rounded durian puff. Seal the puff by pinching the seam. Arrange the puff seam side down on a parchment paper lined baking sheet. Brush the top of the durian puff with the egg wash and bake for about 25 minutes or until golden brown. Serve slightly warm. I really don’t like the frozen durians you get in the US. Fresh is best! Durian season is starting up again here in Kuching. We’ve already had our first one, and look forward to eating and cooking with more as the season progresses. This really looks so good. I have been dying to try durian just to see what all the fuss is about. I am sure I can get one somewhere in GA..maybe. I have routinely given my 11 year old boy unusual foods since he was born and while he likes this and the odor does not bother him I can barely get it down. Yes, durian can be very challenging for the uninitiated. The Thai Morn Thong durian is a mild one to try. The puffs are delicious and is a good way to try it out as well. I had these at a dim sum restaurant for the first time and was surprised at how much I enjoyed them. Yes, I admit I was a little frightened of the durian aspect. But in this pastry, it was really wonderful. Funny! Durian does taste like eating sweet raspberry blancmange in the lavatory! But I quite like it! Wow, great stuff here Kian! I just need to find where Durian is available in these parts. Who knew it could be made into pastry!? Thank you for sharing! What a great post! I’m so interested in durian after having seen Andrew Zimmern unable to eat it multiple times now. I just wonder if anyone actually likes the stuff from the get-go or if it’s entirely an acquired taste. plumpdumpling, You know I’ve never really thought about that. I suppose it is easier to “acquire” the taste if one is exposed to it all life long. Although I do know native Singaporeans, who never did like durian. love durian, unfortunately we can only get the frozen thai ones here in Melbourne. really bias towards the good Malaysian ones!! I had durian many times when a Peace Corps Volunteer in Sarawak, Malaysia in the early 70s and it was delicious! Many a night I spent in an Iban longhouse sharing durian with the villagers. I’ve only found it a couple of times since returning to the U.S., always frozen, and my wife thinks I’m nuts. Now that I’m pregnant I’ve been craving durian even more! I’ll have to try making your durian puffs altho the pastry looks a little challenging. BTW, if I’m not wrong, there was a time when Thai mornthong durians with their small seeds and rich creamy flesh were quite sought after in S’pore. This was before D24 and King of the Montain (or whatever some of the new varieties are called)! Discovered D24 frozen durian mooncake in SF bay area this year. Mon thong just doesn’t cut it, compared to D24. Malaysia has many other kinds, words can’t describe the many sensations durian triggers! Just watch out for the burps! I never thought I would like durian. 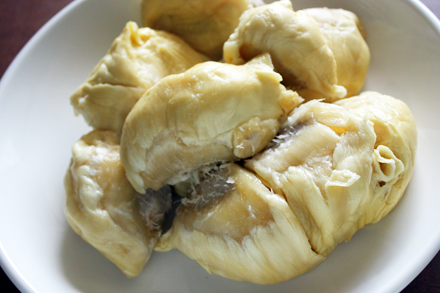 When I was a kid, durian is something that I hate because of its odor. I prefer eating durian candies back then. But hey, durian is one delicious fruit! No. You can in fact freeze the puffs once they are wrapped. They bake them directly from the freezer whenever needed. But do allow about extra 10 minutes to the baking time.